Besides the scenery, the thing that excited me most about Marrakesh was the souks. They're world famous for having some gorgeous goods, delicious food, talented henna artists, and cray cray snake charmers. I'm so happy with all the things I bought that I thought I would start a new series showing you guys my treasures! • Crystal/geode from the Atlas Mountains: Back at home, if I wanted to buy one of these I'd be looking at over $100 for just part of the rock. In Marrakesh, I nabbed this bad boy for $10, and got the ENTIRE rock. You can't really tell because the lighting in this photo isn't great, but the inside is vibrant dark purple (with a sprayed on sparkling green overlay I plan on washing off, eventually). It's currently sitting on my bedside table, but my plan is to one day use them as book ends! 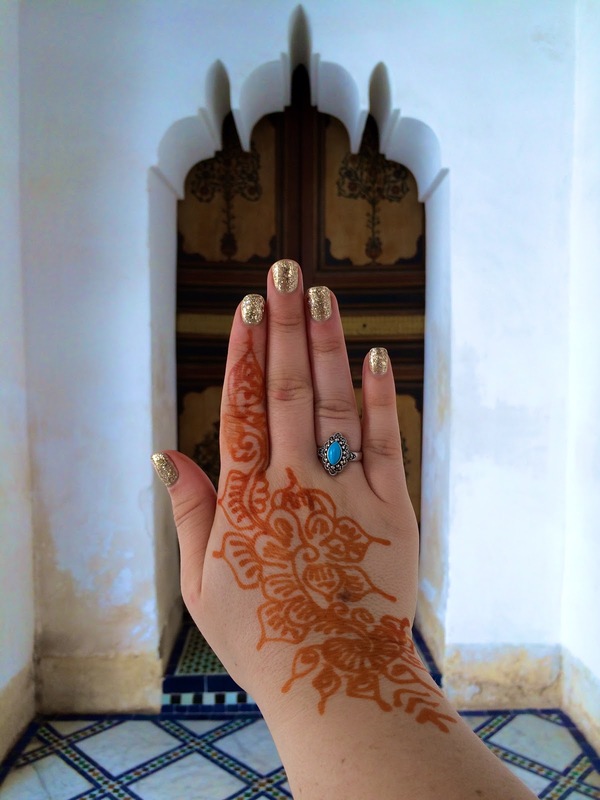 Silver & turquoise ring: I read online that silver is one of the goods that people should purchase while in Morocco, and I now understand why. The quality of this ring is incredible! It was $40, and they even re-sized it to fit my finger on the spot. I love buying jewellery in places that I travel to. I feel like it's a much more practical (but still fun!) purchase than your typical touristy goods that generally sit and collect dust. TIP: People WILL try to sell you fake silver goods. The way to tell if it's real silver is to look for an authenticity number stamped somewhere on the good. For example, mine is stamped on the inside of the ring. White Clay & Mint Tea: I know what your first thought was when you saw these packages - and no, I did not purchase an obscene amount of marijuana and cocaine. Although I won't lie, I literally asked the shopkeeper "Am I going to be okay going through airport security with this???" Mint tea is a Moroccan specialty, and oh my god it is sooooo GOOOOOD. I'm not even a tea person - but I am obsessed with this tea. As for white clay, it's a natural substance found in the Atlas Mountains that can be used for a number of reasons, but I bought it specifically for beauty purposes. It makes for an amazing face mask! Rose Oil: I originally wasn't going to purchase this, but the man who sold me the white clay told me that Morocco is known for its roses and takes a lot of pride in them. He also said if I removed my mask with rose water (which I can make from rose oil & water) that my skin will seriously benefit from it. Rose water has anti-inflammatory properties that can help reduce the redness of irritated skin, get rid of acne, and regulate the skin's pH balance. Argan Oil: Argan oil is a Moroccan staple, and has seriously blown up in the world of Western beauty products. It's normally very expensive because it's only found in Morocco, but because I happened to BE in Morocco, this bottle was a sweet $8. I use this primarily as a body moisturizer after shaving, but it also works wonders on the hair & face. TIP: When purchasing argan oil, make sure of 3 things: 1) That the bottle is dark. A dark bottle is generally a sign that the product inside is a high quality and needs to be protected from the sun. 2) That it has a serial number on it, and is registered with the country as a quality good. This is usually very visible on the product (mine is on the bottom of label) 3) That you are purchasing the CORRECT type of argan oil. Argan oil is also sold as a cooking oil, and when it it sold as such it is not suitable for beauty purposes & vice versa. Vanity mirror door: I'm not sure the history behind these, but I saw them everywhere in the souks and thought they were so beautiful. Joey actually bought this for me as a Valentine's Day gift (*heart flutters*). 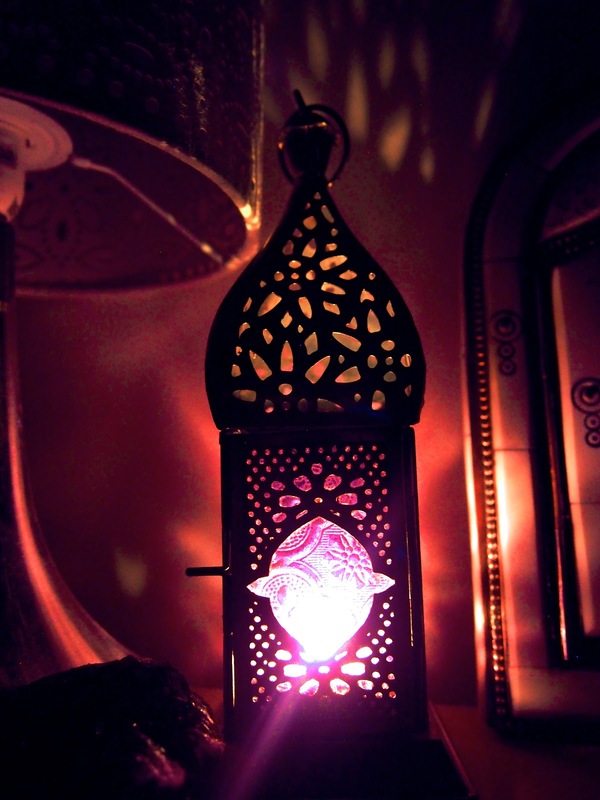 I love the craftsmanship and I think it looks really pretty on my bedside table. It also comes in handy when I need a close-up mirror while I'm doing my makeup! Some things I didn't purchase in Marrakesh, but I've read are very high-quality in Morocco: leather goods, sandals, rugs, tea kettles/glasses, cookery, and jewellery boxes. Sadly none of these things would have fit in my luggage, but at least I have some shopping to look forward to next time I visit!